How to Pick a Mariachi Band AY,AY,AY!! Chose the right band for your ceremony or dinner music! Please make sure when you hire Mariachi Bands that they are at least a 9 piece Band and authentically dressed. They must wear their full outfit so they look amazing. 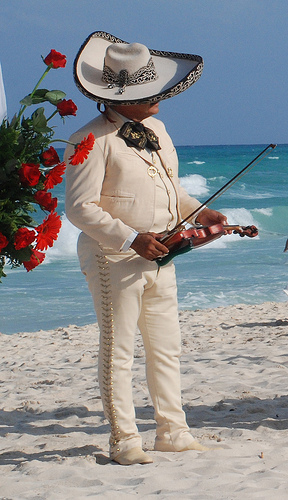 The attire of a mariachi group, called a "traje", consists of botines(or ankle boots), a sombrero(or broad-trimmed hats), a mono(or large bow tie), a chaleco(or short jacket), snug trousers without back pockets, a wide belt "cinto pitiado", and botonaduras(or shiny buttons) on the side of the pants. This will make your night even more memorable because most guests end up taking pictures with the sombreros and it is an enhanced experience! Insist of your wedding planner that they verify this for you. Check this Mariachi out, I threw in Luis Miguel as a bonus for you girls! Click here to watch the video. Also discover Trios for your musical entertainment. A Trio is a very romantic and an excellent choice for dinner music. 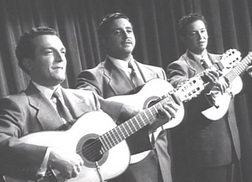 This music is very famous in Mexico and if you would like to listen to what it is please check out Trio Los Panchos who are the best there ever was in Mexico on you tube click here to watch the video Either type of music group should cost you about 400 to 600 Dollars an hour for very good musicians. I barely could do the you tube link haha not a big tech guy... but I know weddings and Mexican music well, hahaha thanks for the props! 3 or 4 piece bands can be fun but they are NOT Mariachi Music. I am sorry my link does not work anymore or since I put it up but I suggest you ask for Mariachis with at least 8 to 10 musicians. You should have 2 trumpets, one base, 3 guitars, 3 violins or 4. That is a Mariachi band... and actually there are some with more instruments... but this would be a typical authentic Mariachi. The trumpets make all the difference! Good luck and if I can help with anything else let me know!